Yes, totally broken for me as well. Regardless of which browser (Opera, Safari, ... Mac OS X) or search terms I use. "Warning – visiting this web site may harm your computer!" Searching Google from my computer (either Chrome or Firefox) , ALL results are coming up with the warning "This site may harm your computer." Anyone else? Me too, I wonder why? No matter if I search in English or Swedish, my two languages, all the same. Yes.. seeing on all browsers, no matter the search term. A big bug coming here? Got it in french too : Ce site risque d'endommager votre ordinateur. Back to using Alta Vista instead! Yep, I've got this error too.. tried on Finnish and English sites. What a bug! The whole world is going to ground to a halt! So many false accusations. This should not go unfixed for long! So, Google actually stopped for over 30 minutes! this is really bad. Total blackout of google. First time since it started? In my first post I called it a bug, but after thinking it through for a while I realized this can't be a bug. First of all its known that it takes google ages to spread something between all different servers to make an update worldwide. Personally I would say its more likely that this is done by a single person, which bringsus to three possibilties; A somebody hacked google (out of question), B somebody inside google wanted to check out his power, C there has been some fighting inside google and this was the threat... I am probably slightly overnegative, but as this happened to all sites at once it can't be the crawler which would have started to indexed sites wrongly and a bug in the message showing itself would have been solved in minutes. This is most likely something in between (I would say) created deliberatly. Assuming that David Mulder was one of the first to experience the bug. The bug started at 14.40 GMT. And has so far being going on for 30 mins. Does anyone have any idea whats happening here? It's getting very annoying copying and pasting sites into my address bar. In your opinion, how long should it take to fix? Why have no mainstream bloggers picked up on this yet? Apparently stopbadware.org is down. This could have caused the issue. Also Works from the Firefox search box as well... Direct text inserts into Google.com are not working. weird. Not permission messages after using google search (through the google search button) by removing everything except the q parameter it works for now. it could have coused by invalid data from stopbadware.org!? It's seems that everything is working again. Although stopbadware.org isn't loading still. Fixed but not on all Data Centers, yet. And somebody asked me how long I would expect something like this to be fixed: a few minutes, why? Because I have been trying to get a real harmful site to display me a warning and if I am correct they simply disabled the message for ALL sites. Do you think it is real ? To clarify, the warning interstital page also showed when you clicked on the result page's title link, not just when you clicked on "This site may harm your computer", right? The bug showed up on all browsers and multiple machines....uninstalling the Google Toolbar took care of it. "Google Flags Whole Internet As Malware"
Philipp, Google has just updated their blog so you might (if you find it necessary) re-edit the post. 1. Can Google break the whole entire internet? Yeah, a little bit, but so far not catastrophically. 2. How quickly can Google fix the internet after they break it? In a little more than an hour. Nobody is perfect. Google Search is back to normal. World is still spinning and--ZOMG THEY BROKE TEH GMAIL???!!! FLAY THEM, I SAY!!! TEHY AR UNRESOPNSILBE AND SHULD GOE 2 GAOL!!! Google's actual revenue probably did not go to zero during those 40 minutes, but I imagine it was affected. I decided to check the current reports for some select sites. I checked "google.com", "microsoft.com, "yahoo.com", and "blogoscoped.com". Below are some highlights. "Malicious software includes 1 trojan(s). Successful infection resulted in an average of 0 new processes on the target machine." "Over the past 90 days, google.com appeared to function as an intermediary for the infection of 1 site(s) including loady.de/." "Of the 15600 pages we tested on the site over the past 90 days, 2 page(s) resulted in malicious software being downloaded and installed without user consent. The last time Google visited this site was on 2009-01-31, and the last time suspicious content was found on this site was on 2009-01-30." "Malicious software includes 2 scripting exploit(s), 2 trojan(s), 1 exploit(s). Successful infection resulted in an average of 3 new processes on the target machine." "Malicious software is hosted on 3 domain(s), including 710sese.cn/, rmk-lgs.com/, weixk.com/." "5 domain(s) appear to be functioning as intermediaries for distributing malware to visitors of this site, including templatecentral.com/, vvk5.cn/, topxml.com/." "120 page(s) resulted in malicious software being downloaded and installed without user consent." "Malicious software includes 93 scripting exploit(s), 88 trojan(s), 17 adware(s). Successful infection resulted in an average of 6 new processes on the target machine." "Malicious software is hosted on 222 domain(s), including incheongh.com/, asmkuang.cn/, lineacount.info/." "113 domain(s) appear to be functioning as intermediaries for distributing malware to visitors of this site, including taiwanlottery.com.tw/, 89.28.13.0/, clicksoverview.com/." "Over the past 90 days, yahoo.com appeared to function as an intermediary for the infection of 4 site(s) including tynews.cn/, bboit.cn/, xntelec.com/." "Yes, this site has hosted malicious software over the past 90 days. It infected 10 domain(s), including 68ka.com/, hai163.cn/, duba.net/." The report for "blogoscoped.com" seems clean. Ianf : The title "Google Flags Whole Internet As Malware" sounds like something made from TheOnion.com, yet it is real! Why hasn't anyone asked something very important, how did Adwords get affected and will any company out there be stupid enough to sue Google for thus mishap? That's OK google, we forgive you. 40 mins. 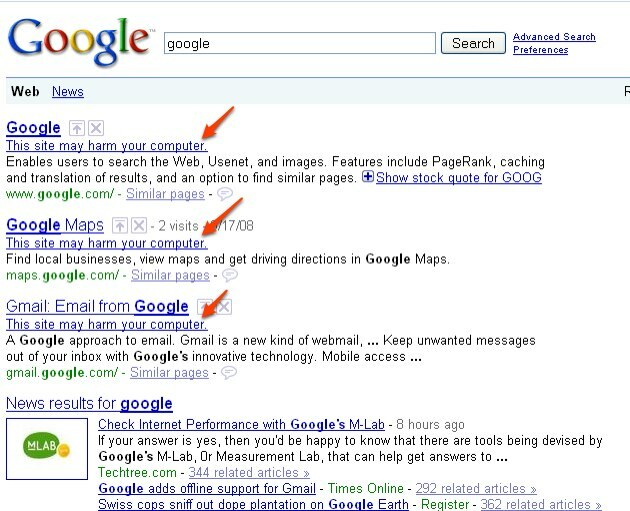 made searchers realize that there's no decent alternative for google :).